This weekend our esteemed friend Dr. Craig Jessop comes to Champaign to lead The Chorale in concert on Sunday evening at 7 at Faith UMC (1719 S. Prospect Rd) in works by John Rutter for chorus and orchestra. Since part of this blog's function is to give you a back-stage pass to the glamorous life of a concert artist, I'll sneak you in a couple of days early and show you how I am preparing for this august event. 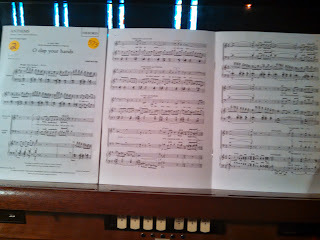 I am, unfortunately, quite handicapped as an organist by the sad fact that I was born with only two hands and two feet. I have tried to find various ways to overcome this. Having fewer arms than Vishnu (who despite his obvious qualifications in this regard would have not been likely to pursue a career as a church organist for various reasons, such as being a Hindu deity) I nevertheless soldier on, but I find that at times getting through a piece of music without an assistant (many of whom, like Vishnu, are also reluctant to get involved with church organs) requires careful planning. 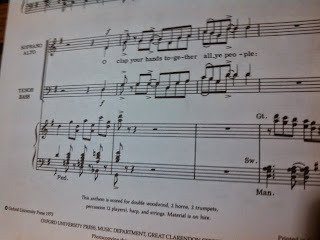 Two of our pieces this year involve only the organ and the choir. 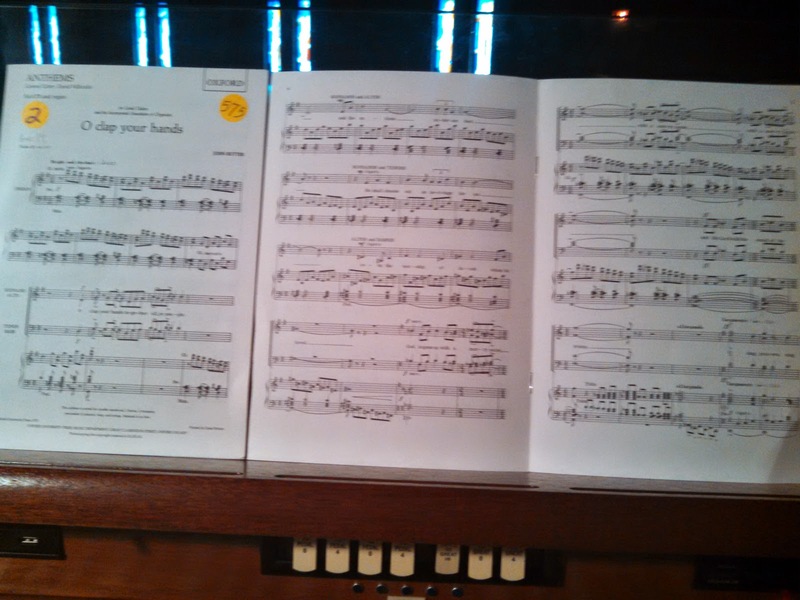 I have been playing them for the choir all semester on the piano at our rehearsal facility, but transferring them to the organ is quite different. 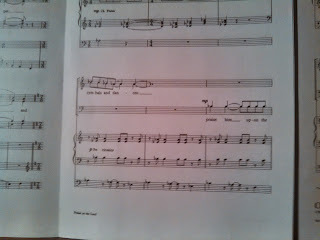 Now I have two manuals and a variety of stop changes to deal with as well as page turns. 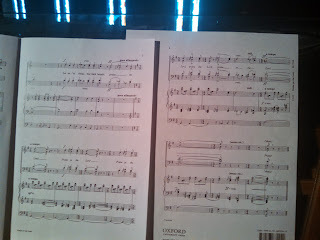 I will have to be very precise in my choreography or there will be a disaster at the concert. Here is my plan. My pages had better look like this in the beginning. 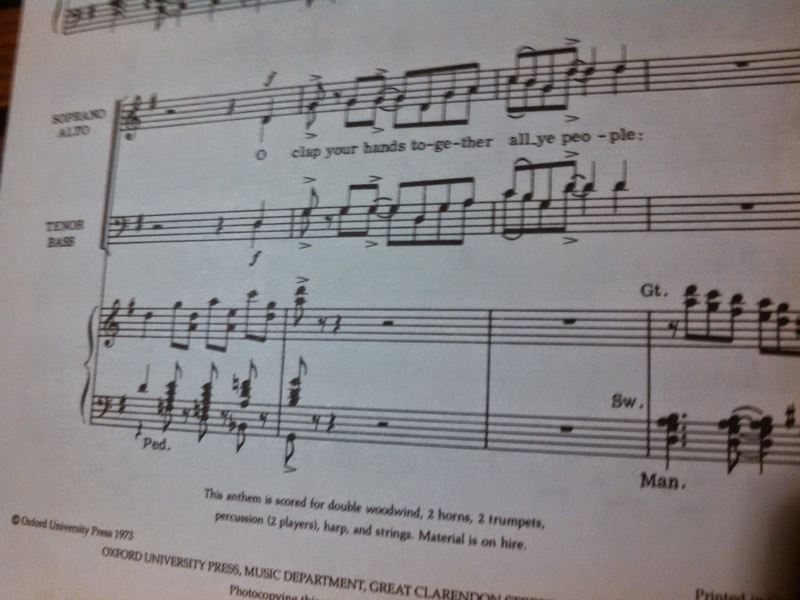 There are two copies of this anthem, the second of which I wisely procured from the Chorale librarian last week. Said second copy, however, is turned so that pages 4 and 5 are open, so that you are looking from left to right at page 1, page 4, page 5, and the last page, which is to the right of the second copy--trust me. ﻿I had better be quick. Unlike the second anthem in the group, where I can play the next two measures with one hand if need be, these notes don't allow it. 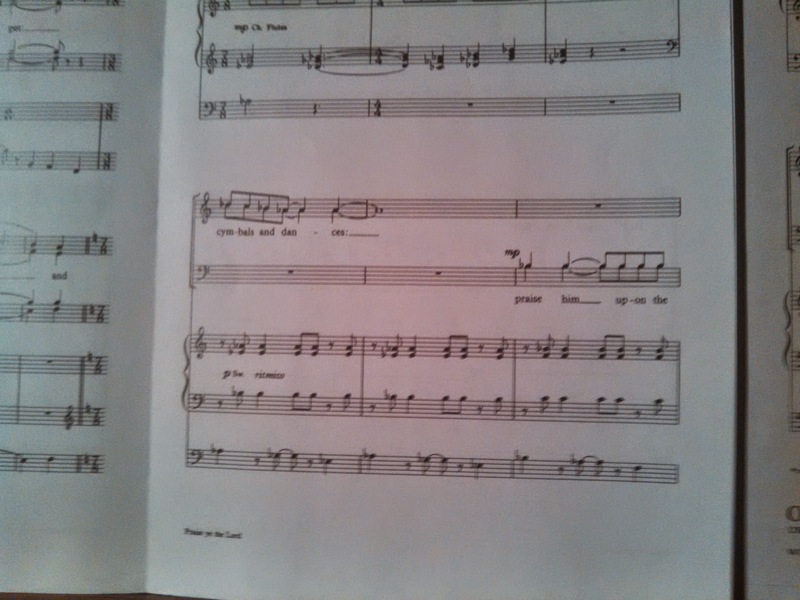 I may, however, revert to a single manual (the softer one), despite the instructions by the composer, so I don't risk drowning the choir when they come in again two measures later. Now I can play pages 2 and 3. At the bottom of the second page I need to kick the toe piston to change registrations on the first beat of the measure (technically 1 and a half). It is a nice 4-foot flute stop alone that I think will compliment the alto entrance well. At the bottom of page three there is no humanly possible way to turn the page, because both hands are occupied and I am very bad at turning the page with my feet (even though they are not playing anything at that moment). This is why I have procured the second copy. I thus proceed through to the end, once I have turned the page of the second copy from 3-4 to 5-6, which I can do, because I can grab both the right hand and left hand notes with my right hand for a few measures while turning with my left (I have a mean left). Wait...I am thinking of the other piece. Never mind. In this one, I simply use the last available pause to pull the mixture stop on the swell for the final push. I need the extra-extra copied page because I had been practicing trying to turn the left hand copy to the last page to avoid the final page turn once the last section started but found it really uncomfortable trying to turn two pages and pulling a stop all in about 3 seconds, even if there is an allargando at the top of the first page there (who knows how much time he will allow?). I think I had better go practice some more.